This 11 x 17 poster features a color image of the Seal of Ohio with a woman's face in the center. 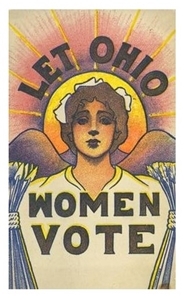 The woman's face is framed by the rising sun and the slogan "Let Ohio Women Vote." The postcard was sent from Columbus, Ohio by Elizabeth J. House to Mrs. C. L. Martzolff in Athens, Ohio, 1915.